When it comes to Wisconsin winters, any temperature over 40 degrees can almost feel tropical. 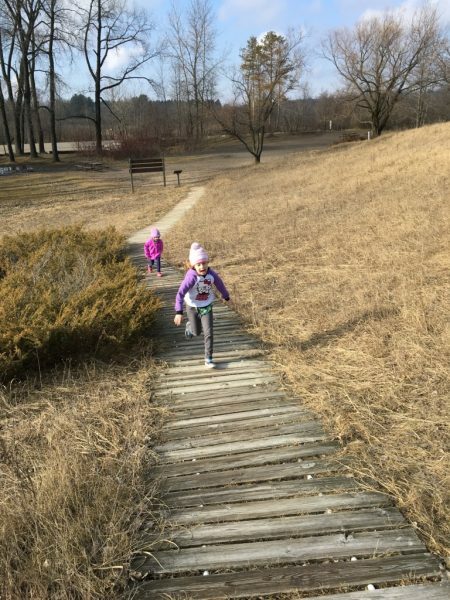 This weekend, we took advantage of the warm weather and made the drive to Kohler-Andrae State Park. 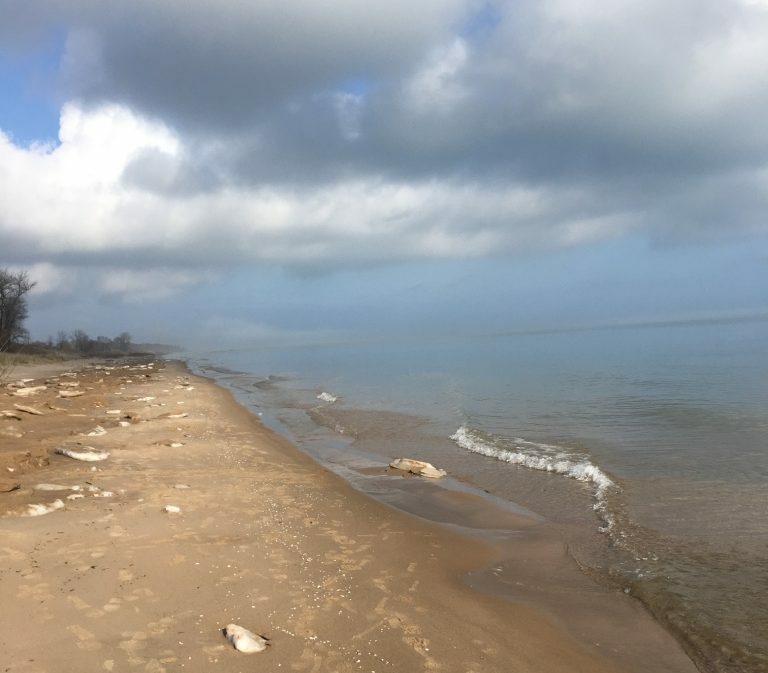 Located in Sheboygan, the park features miles of Lake Michigan shoreline, nature trails, and some really cool dune cordwalks. The beauty of this park was an unexpected treasure, especially smack dab in the middle of winter. The kids loved running up and down the dune cordwalks, paths that seemed to spiral into the distance with no end. At times, we felt as if we were the only souls in the entire place. 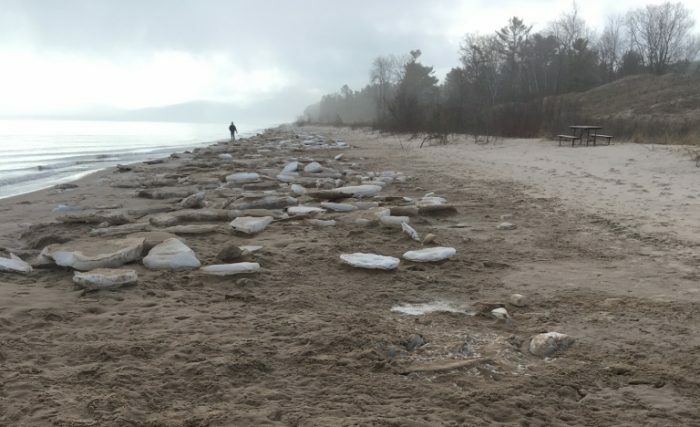 Huge chunks of ice were strewn across the beach, settled into the sand like lounging seals. The kids enjoyed climbing and jumping off these “ice rocks,” their boots splashing into the tiny rivers of water below. As the kids hunted for treasures and made stick drawings in the sand, I found myself looking for signs of life along the beach, picking up shells to see if any tiny inhabitants might still be inside. No such luck: any critters had long since moved out, likely relocated to the belly of a hungry seagull or another animal. Then I happened to see this peculiar-looking little dude lying on his back in the sand. A quick Google search suggested he was a Whirligig beetle, which typically swims on the surface of water. 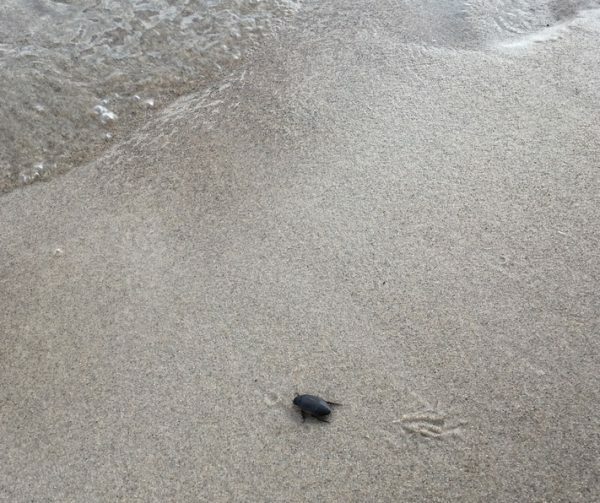 The kids ran over and we debated on whether our little friend wanted to swim or just keep hanging out in the sand. Gingerly, I flipped him over to his stomach, and almost immediately, he began moving in the direction of the water. He had impressive speed and seemed to move instinctively toward his destination. We watched as his body broke the surface of the waves, his tiny legs propelling him forward with a natural grace. He even flipped to his back and performed a pretty solid elementary backstroke. We walked along the shoreline for a while, following his progress. Eventually, the kids worried that our little friend might be getting tired, so we fished him out and placed him in a shallow pond a few yards from the lake, flanked by a couple of ice chunks. The girls decorated his pond with some moss and a few seashells, so he would feel cozy and at home. Who knows if this particular stretch of beach really was his home, or if we’d inhibited or aided him on whatever journey he might have been attempting. Maybe we’ll see him, or some of his family, again when the real spring arrives.